I don't know about you, but I always get a mid-winter 'urge to purge' in anticipation of Spring's arrival. 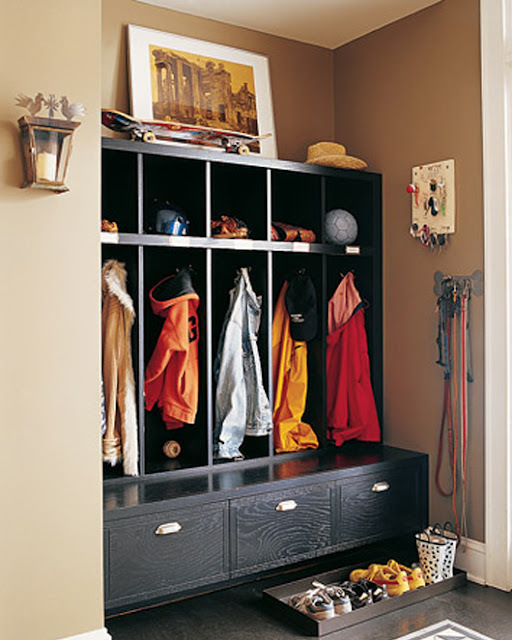 The winter months are the perfect time to focus on getting your indoor spaces organized and functional, especially your entryways - the busiest part of the home with the heaviest (and dirtiest) traffic. Getting this area organized now will allow you to be fully prepared for all the activity and commotion the new season will throw your way. You'll also have plenty of time to enjoy that warm and sunny weather, not having to worry too much about keeping things in order, once a good system is in place. 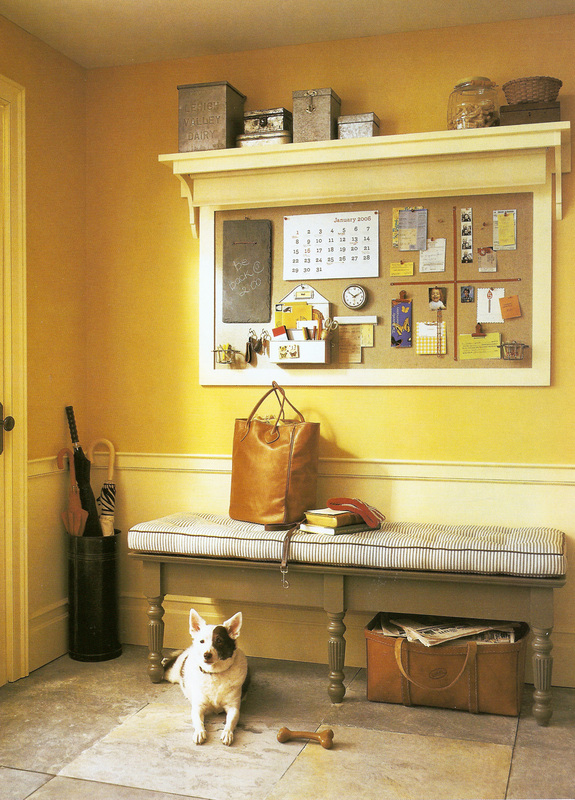 I've compiled some of my favourite entryway solutions from the pages of Martha Stewart Living, many of which I have adapted to my own very small (but very efficient) entryway. This is my all-time favourite entryway design. It is so me! 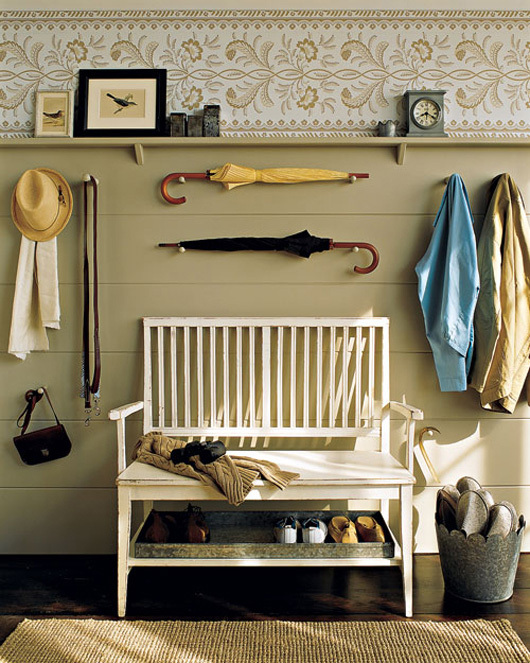 A bench is such a nice addition to an entryway. It allows for seating as you put on or remove your shoes and is inviting to visitors. The bulletin board above is a virtual 'home base' for planning: schedules, notices, reminders, incoming and outgoing mail are all kept here. It's a one-stop spot for the organization of your day. I like the slate board for erasable chalk messages and the little clock. Best of all, you can hide it all behind an opaque roll-down blind in a coordinating colour that you can lift and lower as you please. A combination of shelves, hooks and bins ensures this entrance is kept running smoothly. Hanging "in" and "out" baskets are mounted onto wall hooks to corral mail, magazines and newspapers. Sturdy, galvanized boxes on casters slide easily under the bench and coat hooks keep everyone's outerwear in place. What is nice about this station is the colour. A strategic application of paint gives the whole area the appearance that it is a built-in unit. The bench, shelf and wall are all painted the same unifying colour. A bench on casters provides simple seating and storage. On the wall above an array of hooks was hung in a free-form pattern to provide a place for hanging coats, hats and bags. The wallpaper is both functional and visually energizing: you can easily wipe it if it becomes marred and it provides an enlivening mood-boost to visitors who enter the space. This is such a great entryway: one of my favourites. It has charm and function to spare. An old bench plays centerpiece to the space. It features a lower shelf for a shoe tray to keep worn shoes off the floor. A basket proffers slippers to visitors and a thick sisal rug keeps the hardwood protected. 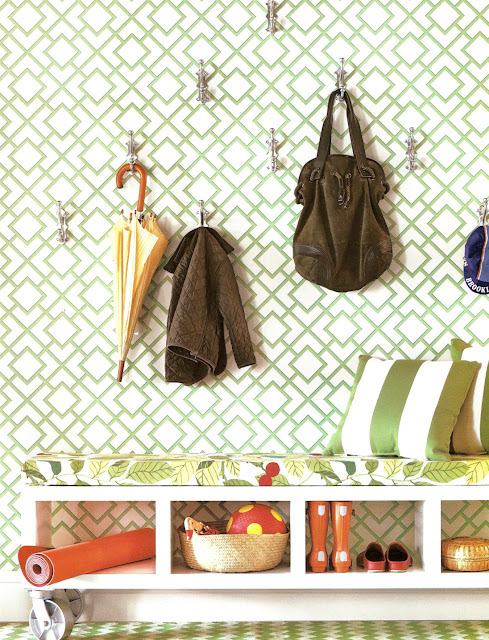 On the wall, hooks have been installed to keep everything in place, from umbrellas to purses. A wooden mantel, backed by an appealing strip of wallpaper, allows for the display of personal mementos and photographs. Never forget to splash a bit of charm in an entryway! It will lift your mood when you enter the home and will be inviting to visitors. I love this storage unit built into a nook of an entrance. The cubbies provide storage areas for each member of the family. 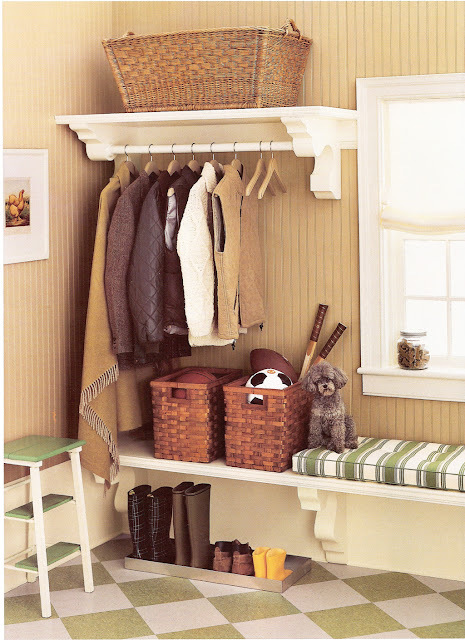 There is a section for each person's coat and hat topped by a smaller cubby for that individual's accessories, such as baseball mitts, soccer balls and cameras. A bench allows for seating and easy shoe removal and three large drawers hold seasonal items. A wall-mounted key corral keeps keys in place while a hook keeps dog leashes from becoming tangled. ENTRYWAY MUST-HAVE: The boot tray is a "Good Thing" I have loved since its debut in the magazine in the mid-1990s. 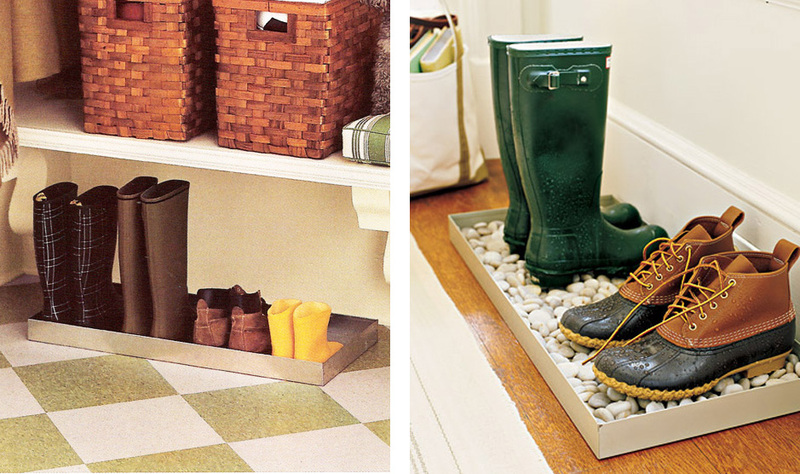 It is essentially a tray with a very high lip where you can place your wet and muddy boots when you enter the house. Many retailers sell these in various materials, from stainless steel to rubber. Williams Sonoma sold one a while back, as did Smith and Hawken's. Home Depot and other hardware stores sell them. Or, you can convert old cookie sheets and baking trays into boot trays, layering them with pebbles to allow the dirt and water to filter away from the boots so that they are not standing in a pool of melted muck. I hope you've found these ideas helpful and inspiring. I turn to them again and again for inspiration and guidance. A new camera is on the way and by next week I hope to share some of my own photographs of my home, my projects and my favourite things. My current camera, after 6 years of very good service, just isn't doing the trick anymore. So, stay tuned! Greetings from London. Amazing post and great ideas, love it. Happy belated Valentine Andrew. Wish you a wonderful weekend.